You know that feeling you get after you sign up for something? At first, it's a great idea. But as the day gets closer you start feeling nervous and a little regret? All the training you planned on doing, never happened. And all of a sudden the day is here. You're laying in bed nervous as can be, reminding yourself "you can do this" but in the back of your mind believing you aren't ready? This is what happened to me with Mudderella. 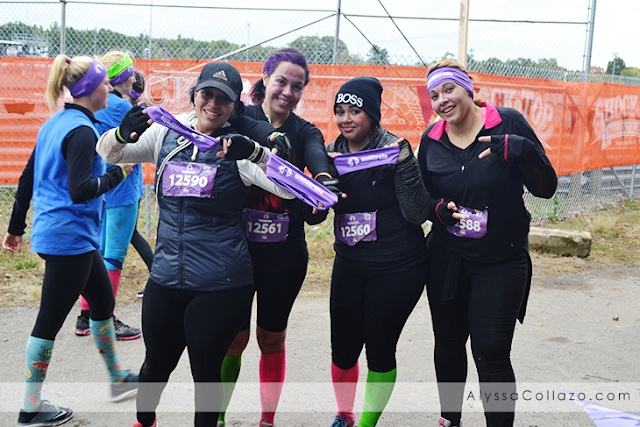 My sisters & I signed up for Mudderella last Spring. This is something we always talked about doing but never really looked into it. We were over the moon excited. After we all signed up, we promised each other we would train and work together as a team. Summer flew by. Between all the weekend trips and back to school preparation we lost track of time. All that training we had planned, just didn't happen. But we all kept busy. With my daily family hikes, my sister doing Yoga and the others with full time jobs, we all seemed okay. As the day got closer, my nerves kicked in. It really hit the night before. I remember pacing back and forth debating which obstacles I could and couldn't do. I was terrified. My hands would get sweaty just thinking about going through a tunnel. But I went. And the morning of Mudderella, as I was putting on my workout gear and waiting for my sisters I smiled and told myself YOU CAN DO THIS. I received numerous encouraging texts and my mom decided to join and be our Cheerleader and Spectator. Everything was falling into place. Besides the weather. It was COLD and raining. The drive to Mudderella was pretty silent. I think we were all lost in our thoughts. As we pulled into the parking spot and looked at the shuttles, we all just kinda looked at each other and smiled. Our shuttle ride was full of other ladies participating in Mudderella, it was encouraging hearing other people stories. It definitely changed my feelings. Instead of being nervous. I was excited. Having not just my sisters by my side but my mom as well, I truly felt thankful. After checking in and receiving our Bibs along with adding some face paint, we were ready. Standing at the finish line I finally noticed something. Something incredible. Surrounding us were hundreds of women. Women just like us. Some more fit and some more nervous. But we were all smiling. The energy around us was amazing. There were big teams and small teams. Some wore matching costumes, while others kept it simple. We were all freezing. Jumping in place to keep warm. After stretching and hearing Mudderella's story. We all heard a countdown. 5.4.3.2.1.....GO! We started running, which didn't last very long. 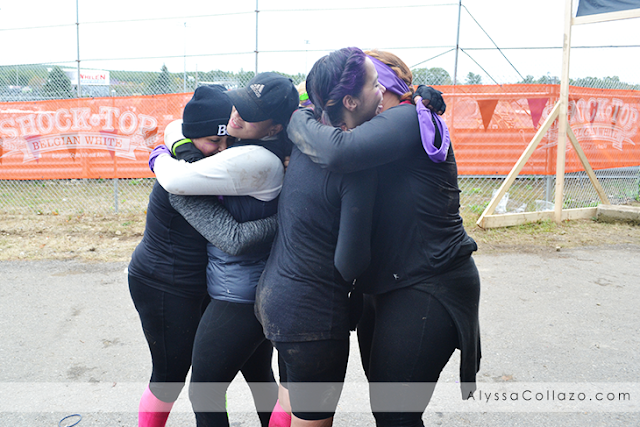 We all decided as long as we finished Mudderella, there would be no set time. We wanted to pace ourselves. 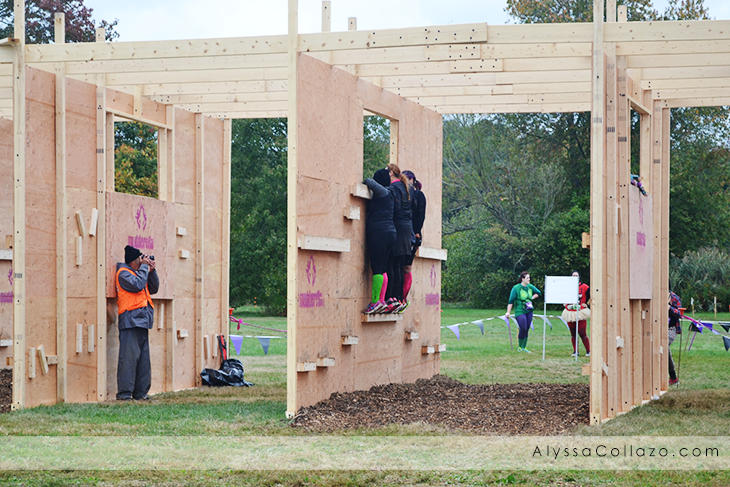 The first obstacle came and we accomplished it. And after a few we all thought we are actually doing this and it's pretty easy. Until we reached our first wall. Climbing over it was easy. Throwing your leg over and climbing down was the hard part. My sister is scared of heights. She sat at the top of the wall and cried but with a little encouragement, she did it! But that wasn't all. We helped others get over there fear as well. We sat at the top of that wall and held a complete strangers hand, telling them "I promise, you can do this"! And guess what they did it!! The hardest part for me was all the climbing. At one point I literally felt like giving up. That was until I felt a hand on my back and turned around to a determined smile given by my sister. I knew at that point, no matter what I would finish Mudderella. Through all the mud and obstacles. We never once stopped laughing or encouraging each other. 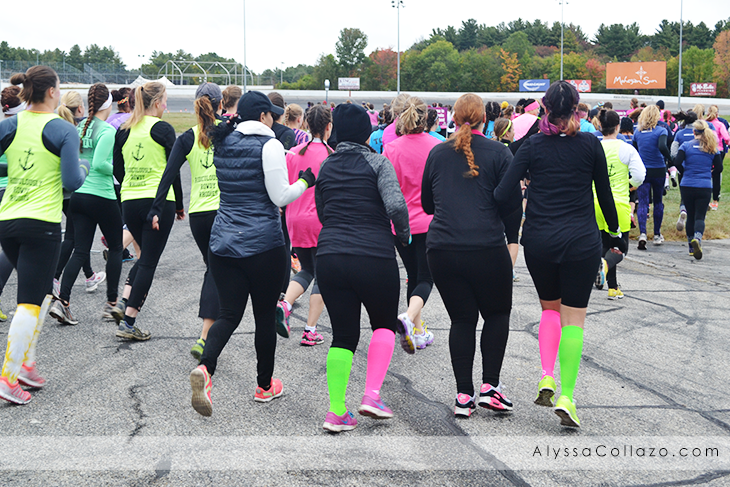 Unfortunately due to the weather the slide at the finish line was closed so we decided we would run the last 200 yards to the finish line. The end was near, yet so far away. Crossing the finish line was emotional. We did it! We really did it. We hugged and cried. And hugged and cried some more. This experience was extraordinary. Thankfully Mudderella did not live up to the fear I had put on it. Instead I learned my body is still strong. But not only that. I grew a tighter bond with my sisters. I look at them and think of all the amazing words they said. How they stopped to help me, no questions asked. How we left no one behind. How we helped complete strangers over come there fear. This is a day I will never forget. Mudderella is an every woman event. It is a girls weekend activity, that will challenge you but not destroy you. Am I sore? Absolutely. But I overcame my fears with the most amazing team. We laughed until we cried. We threw mud at each other. We watched each other overcome our fears. For me that was the best part. 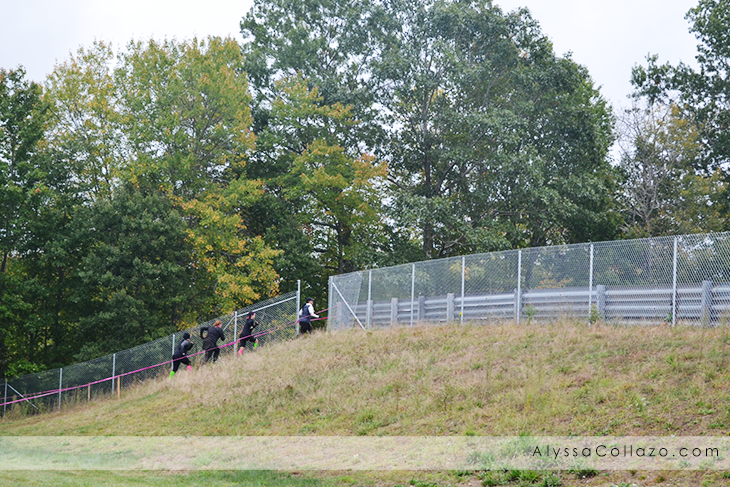 And when I sign up for Mudderella again next year, I hope I remember this. Check out Mudderella events near you and don't be scared. If we can do this, so can YOU! Good for you guys for doing this. It's definitely not something for me, but you guys should be super proud of yourselves. Definitely an event I have never heard of before. I bet those obstacles were difficult. Good for you and your friends\family for getting together to take on the challenge. Looks like you had a lot of fun. I have always wanted o do one, but SOOO not in good enough shape to do it. If I ever get the nerve to do it I bet I would have a ton of fun. I am in no way shape or form in good enough shape for this. I have mad respect for the people who can do it. Those things are tough! I sooo want to do one of these! Hoping there is a muddrella event near where I live! This sounds like a really tough race but it's so cool! It's awesome that you were able to participate this year! I don't think I could do this, but it definitely looks so fun. You all looked like you had a blast. Oh wow! Go you! I think it is so amazing that you can complete something like that. Wow! That seems like an intense experience. I don't think I'm quite fit enough but I'm sure I would enjoy it regardless. Glad you enjoyed it! Awww...that looks really fun! I would love to do something like this with my friends! You are a rock star! I would love to do something like this. But I'm SO dreadfully out of shape. One day! Very inspiring. I wish I could have buddies to do fitness stuff like this. One of my relatives loves to do these mud runs. I love it when she shares all of her photos on Facebook. It motivates me and makes me wanna do it too!! What a fun and intense experience! I would love to do one of these with my girlfriends but we can never manage to organize ourselves! I have been wanting to go to a Mudderella. I need to train over the winter so i can try in the spring. It would be an amazing accomplishment. I always tell myself one goal in life is to run a marathon. This one looks like so much fun. I'm glad it wasn't so scary. :) It looks like it was an amazing time, I'm glad you wrote about the experience. Ahhhh yay for doing this!!! I'm so not into running or anything like this. These races do look like fun though! i love a mud race! i've done the spartan, savage, muddy buddy, and the mud crusade and have had a blast at all of them! I'm so gad the experience was a good one! I totally understand about your initial nervousness, but so glad it ended up being exciting! This looks like a fun and great experience but I'm not quite sure if this is for me. I'm sure though that it's very fulfilling once you complete the obstacles. This sounds like so much fun. I wish that my body would allow me to do something like this. Good for you! I have been studying various Martial Arts since elementary school and I am all about women kicking @$$ and doing it for themselves! That is so awesome! I really would have loved to do something like this. So cool! I would love to do something like this with my best friend! Sounds like an amazing experience. I wish had female friends who I could go and participate in things like this with. All of my besties are out of towners. This looks like a lot of fun! This looks like a lot of fun and even better to do it with your girlfriends. I've done several muddy and not so muddy obstacle races and they are a good time. Kudos to you for doing it. Thats amazing you did this. It looks like a lot of fun. I would totally do this with my sisters. How fun and exciting! I have never tried anything like this before, but I'd love to sometime. I would love to participate in a udderella event. Sadly, there is not one in my area or even within driving distance. Wow good for you! This is so inspirational! I really need to get my but moving! What an amazing thing you guys are doing. Look at how strong you are! I could never climb that wall!